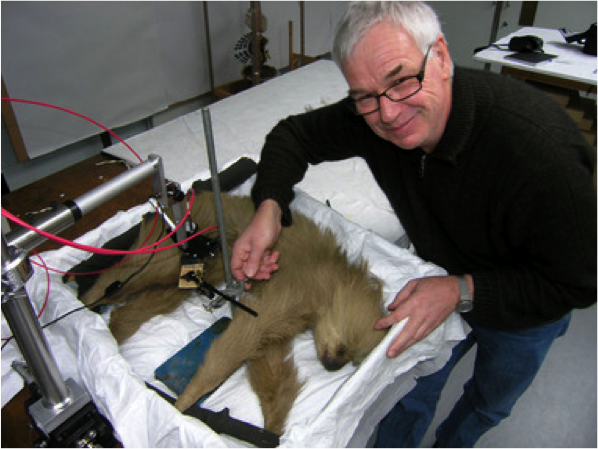 Alongside the lightfastness testing described earlier in this blog, we are developing tools to support the efforts of other individuals and institutions seeking to preserve collections of historic mammalian taxidermy. To do this, we needed to deepen our understanding of the historic and modern materials and techniques used in creating these objects, the common condition issues affecting them, and methods of remediation, both historic and modern. Working toward these aims, we conducted an inventory and condition survey of taxidermy in storage in the Department of Mammalogy of the American Museum of Natural History. This survey was intended to accomplish the goals set out above with the added benefit of providing the department with a searchable, data driven inventory of the entire mammalian taxidermy collection. This kind of inventory can serve as a basis for planning and decisions related to collection management and storage, loans, exhibits, and associated conservation needs. The Department of Mammalogy is one of four departments in the Museum’s Division of Vertebrate Zoology Division. The department’s collection comprises more than 420,000 specimens from around the world, although only a tiny fraction of those in storage are taxidermy mounts. This fraction still represents about half of the mammal taxidermy at the Museum, with the other half on permanent display. These numbers should not be surprising: museum-quality taxidermy is costly to produce and limited in its scientific uses compared to materials such as study skins or skeletons. Instead, taxidermy is valued primarily for display, so it has been produced in relatively small numbers for specific exhibits over the years. Thus, the percentage of specimens on display versus in storage is much higher for taxidermy than it is for other materials that are more often used in scientific research. Among the Museum’s mammal taxidermy holdings are numerous examples from the founding collections that were acquired in 1869 and are now approaching 150 years old. How are these specimens holding up after so many years? Over a period of four months we spent an average of two to three days per week surveying. We worked around visiting researchers and staff using temporary photography and examination stations in each room. Each specimen took five to 10 minutes to assess, depending on its complexity and accessibility. After opening every storage cabinet and pulling out every drawer to ensure that no specimen was overlooked, we assessed approximately 635 individual mounts in 30 mammalogy-collection storage spaces. Using a custom-built database, we tailored our survey parameters to record identifying information for each specimen, an assessment of its condition, and recommendations for treatment. If desired, the data collected can be exported in CSV and PDF file formats and then imported or attached to records in other existing databases, such as the EMu database system used by the Museum’s Division of Vertebrate Zoology. Survey database example entry (not actual specimen in the collection). Each specimen was given an overall condition summary, identifying it as Excellent, Good, Fair, or Poor, and further noting whether it is Stable or Unstable, based on the likelihood of existing damage worsening if left untreated. In the final section of our survey, we recorded the nature and extent of any conservation treatment that would be required to make the specimen stable or suitable for exhibit, such as skin repairs, reconstruction, general grooming, dry cleaning, etc. Together, all of this documentation will be used to guide decisions about how best to manage, store, and exhibit historic mammal taxidermy at the Museum, while offering supporting resources for the preservation of similar collections at other museums or sites. Our next post will reveal some of the unique examples that we discovered during the survey. Our blog posting took a short respite over the past few months, as we said a fond farewell and welcomed new members to our original Team Taxidermy. It was bittersweet to say goodbye and good luck to our pre-program intern Ersang Ma, who has been working with the team since summer 2014. Ersang was an essential troubleshooter, tireless preparer of samples, and diligent manager of data. To honor her work, Ersang was awarded an American Museum of Natural History (AMNH) Volunteer Appreciation Award at a recent Museum reception. Ersang leaves the project to attend the Winterthur/University of Delaware Program in Art Conservation this fall. The former associate conservator for the Natural Science Collections Conservation (NSCC) lab and the In Their True Colors project blog writer extraordinaire, Beth Nunan, left the Museum to pursue new conservation opportunities. Thank you for all of your hard work and organization, Beth! Former project conservator Julia Sybalsky moved into the associate conservator role for the NSCC lab. Julia began working in the conservation lab as a graduate student intern in 2010, continued as graduate fellow, and subsequently became the project conservator. In addition to her new duties as associate conservator for the NSCC lab, she will continue work on this project to interpret data, carry out investigations at the Yale University Institute for the Preservation of Cultural Heritage, and provide troubleshooting support. The Team welcomed new project conservator Fran Ritchie in the spring. Fran was a previous pre-program intern in the NSCC lab (2009-2010) and has continued pursuing experiences conserving natural science collections. Now that Fran has joined the project, she carries out analysis at AMNH and is responsible for much of the dissemination of project findings. This dissemination will culminate in a Care & Conservation of Taxidermy workshop to be held at an upcoming Society for the Preservation of Natural History Collections (SPNHC) conference at the conclusion of the project (2017). Exact details will be announced in future posts. In the fall the Project will welcome Caitlin Richeson as our new pre-program intern. Caitlin will assist with sample preparation, data interpretation, and workshop organization. It will be an exciting time as data continues to accumulate and the workshop begins to take shape. Upcoming blog posts will get back to the project information, including how we were able to troubleshoot our new Q-SUN Xenon Test Chamber to collect our first few rounds of sample data! Special Post – Microfading Workshop! On June 26th 2014, Project Conservator Julia Sybalsky and Graduate Intern Gisella Campanelli attended the Microfading and Light Management Study Day, a half-day workshop and demonstration organized by Paul Whitmore at Yale University’s Institute for Preservation of Cultural Heritage (IPCH), and sponsored by IPCH and the Andrew W. Mellon Foundation. After catching an early morning train from New York to West Haven, Connecticut, we arrived at Yale’s West Campus Conference Center for the Microfading and Light Management Study Day, hosted by the Institute for Preservation of Cultural Heritage. We enjoyed two presentations. The first talk, presented by Paul Whitmore, summarized the basics of microfading: what a microfade tester does, how it is constructed, and how and why one might use one. In the second, Bruce Ford, presented case studies from the National Museum of Australia in which microfading informed the revision of overly restrictive lighting guidelines. The result of his study was a cost-effective policy that protects light sensitive materials and materials of special significance while increasing access to collections in general. These presentations were followed by an informal tabletop demonstration of the microfade tester. Paul gave us a comprehensive tour of the instrument and explained how to interpret the spectral data, whose stability is the measure of the relative permanence of the color. Tests on several of the inks from a set of “permanent” marking pens made the point that the label is not always an accurate description of stability. A selection of topics covered in the course of the day’s presentations and demonstration are summarized below. Light has the potential to cause irreversible damage to objects. It can be especially deleterious to colorants, resulting in visible fading. 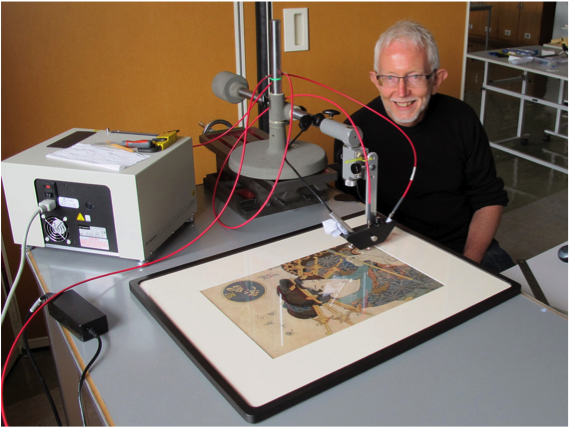 Conservators understand that light-sensitive objects have a finite display life. Nowadays, collecting institutions often adopt guidelines to indicate the lighting conditions and durations of exhibitions of classes of objects (e.g. oil paintings, watercolors, metal sculpture, etc). These policies assume that objects within a class share the same, known stability. Some of those assumptions have been brought into question. Two copies of a Japanese woodblock print by Utamaro. When they were created, they were genetic identical twins, made from the same materials applied in the same way, probably by the same people. Then the two copies were separated at birth, with one image experiencing significant fading (by being exposed to light). 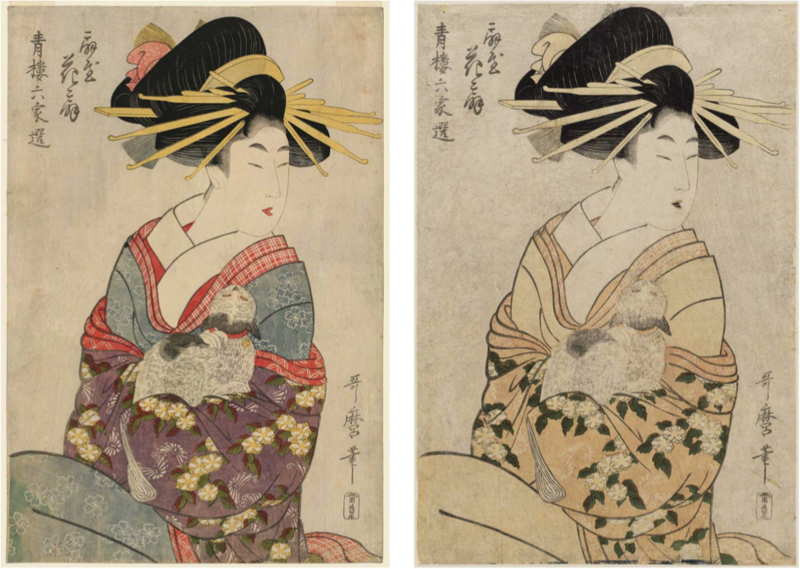 Such experiences demonstrate the profound change in the object from light exposure, but also show that some colors, like the green on the kimono, are not very light-sensitive. Knowing the stability of the colors on an individual object, which may have no identical twins from which to gain information, is the challenge that microfading addresses. In his presentation, Bruce discussed the way in which museums have traditionally managed this ‘display-destroy’ dilemma (table 1). He argued that these guidelines are essentially based on guesswork and assumptions, and challenged this dogmatic approach by raising questions such as: How efficient are these standards? Are they cost-effective? Do they limit public access to objects of significance? Are they counter-productive? Do they exist in order to protect artifacts or to protect conservators? Bruce proposed that the Micro-Fading Tester (MFT) can be used as a reliable tool to predict a colorant’s rate of fade over time. This information, along with an appreciation for the object’s significance, public demand, and aesthetic value, will better inform decisions about that object’s exhibition. A structured significance evaluation can help prioritize conservation efforts and improve communication between conservators and other museum professionals. 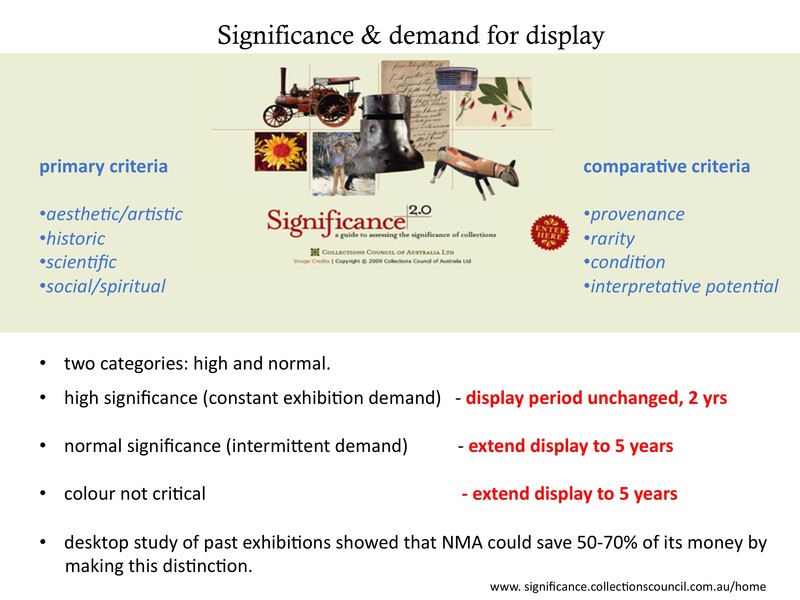 In this example, significance is used in a risk assessment aimed at assessing an item’s likely future demand for exhibition as well as its importance to the museum. Ref: Russell, R. and K. Winkworth. 2009. Significance 2.0 – a guide to assessing the significance of collection. Collections Council of Australia Ltd. Some colorants are more sensitive to light than others. But how do you know the sensitivity of a pigment or dye used on a specific artifact? The conventional ways to assess fading risks to objects come with a price. One way is to exhibit the object and watch to see if its colors fade, either to the naked eye or by tracking the changes with a color measuring device. This approach obviously risks incurring some degree of fading in order to provide the information about the sensitivity to further light exposure. A second approach is to identify the materials present on the object, and to replicate those materials in all their detail in a sample that can then be exposed to light and evaluated. The challenge here is to identify the composition of the colored materials in every important detail, which can be very difficult for natural colorants which may have altered over time. Replicating such a substance is also not usually practical. This approach then becomes difficult and time-consuming, and it is impractical for application to a large number of objects. The last approach is to do spot testing, to shine light on a small area of color and measure whether the color is altered by that light exposure. That is the approach taken in the microfading tester, and the device has the added essential feature that it can be done so sensitively that the tested colors are not changed visibly: it is essentially nondestructive, so the presentation surfaces of objects can be tested safely. The MFT delivers a focused 0.3mm beam of high-intensity light from a xenon lamp onto a tiny spot on the surface of the object and progressively measures any color changes that take place. In doing so, it allows a quick determination of whether an object contains light sensitive materials without need for their prior identification. The machine has two fiber optics angled at 45° degrees to the test surface. One fiber optic supplies the incoming beam from the xenon lamp. The incoming light is filtered to remove both infrared (IR) and ultraviolet (UV) radiation, which cause damage that is usually minimized in museum and gallery lighting environments. The object absorbs some of this incoming light, while the rest is reflected into a spectrophotometer via the second fiber optic. The spectrophotometer separates the wavelengths in this reflected light and produces a spectrum. As the spectrum is continuously updated during the test period, color measurements are recorded and used to calculate. ∆E, a measure of color change since the initial spectrum was collected. Any non-zero ∆E values indicate that the colorant being assayed is being altered by the light delivered. If the color does exhibit a color change during the test, the rate of that change is compared to the rate of fading of Blue Wool standards, cloths whose fading rates are known and have been adopted as the international yardstick for color lightfastness. There are eight cloths in that scale, with Blue Wool #1 being least stable and Blue Wool #8 the most stable. “Fugitive” colors are considered to be in the Blue Wool #1-#3 range. 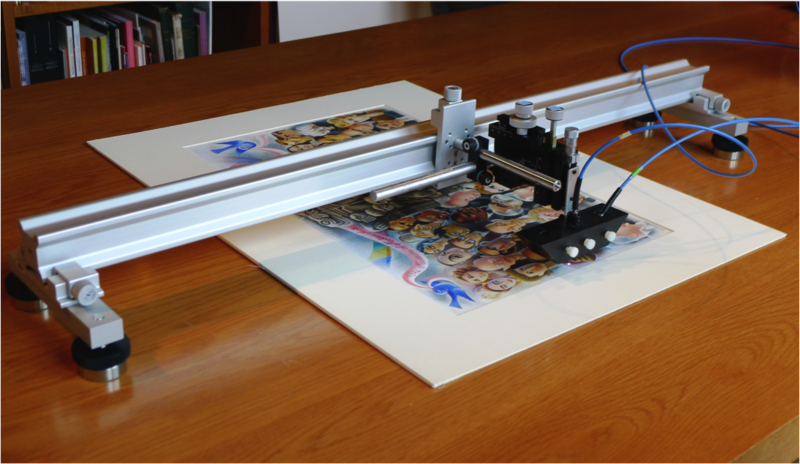 A microfading tester in use, measure the light stability of the colors in a lithograph. ©Paul Whitmore. This incoming beam delivers light up to fifty times more intense than sunlight, exposing the tiny test area to a light dose equivalent to what the average museum object might receive over 5-10 years. By comparing the rate of increasing ∆E values in the test colorant to rates for Blue Wool standards exposed in the same way, the conservator is able to make informed predictions about the future behavior of the test material over time: will it retain its color for a long time like a Blue Wool 8, or is it more fugitive than a Blue Wool 1? To fully understand an artifact’s light sensitivity, each color on the object should be tested, and the exhibition policy for the object based on the stability of the most sensitive color. 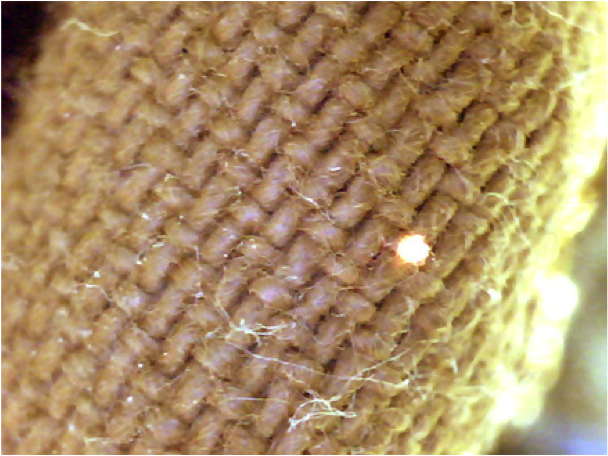 Photomicrograph showing size of area tested with microfader light beam, here being directed onto a coarse-woven textile. Microfade testing is considered an essentially nondestructive technique, as it does not leave a visible mark on the object. Not only is the test area minute, but more importantly, color change is monitored in real time by the operator and the experiment can be stopped if it looks as if visible change might occur. Meaningful results can be obtained without exceeding a ∆E value of 5, while we are only able to visually detect color differences in these tiny spots when the changes are larger than about 15. Damage can be avoided by observing ∆E values in real time throughout the duration of the test. The test usually runs for five minutes, but should be stopped earlier if ∆E approaches 5. There can be a temperature change of 5-10°C within the test location. This is usually inconsequential for most objects, but may require consideration for waxes, plastics, or other materials with low melting points. Paul explained that such test sites will often re-solidify on cooling without any visible damage, but the results of the test would not be reliable measures of color stability. The advantage of using the MFT over traditional practices is that it eliminates the need for guesswork because it is measuring the sensitivity to exhibition lighting of colorants that are present on the actual object, rather than a simulation. Objects that can be micro-fade tested include paintings, prints (even through glass), manuscripts, photographs, 3D objects, textiles, and furs/taxidermy – basically any surface that one can make a color measurement on. 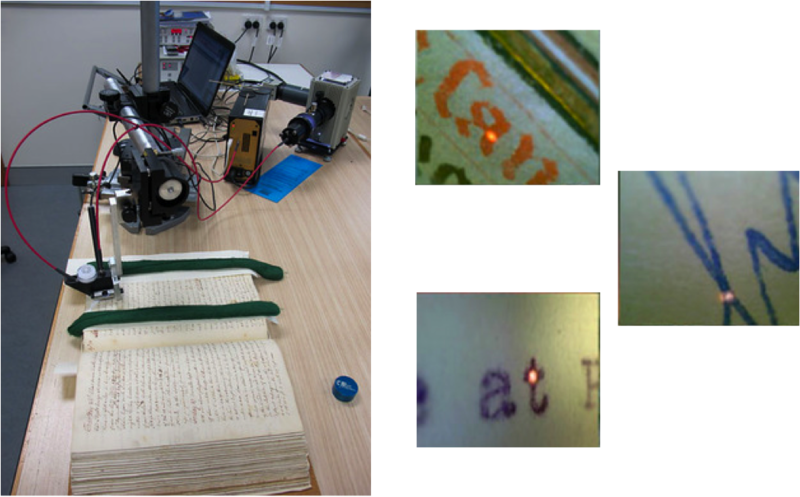 Microfade testing at the National Library of Australia. ©Bruce Ford. Microfade testing of taxidermy at the Horniman Museum and Garden, London, UK. ©Bruce Ford. Microfade testing of Japanese prints, through glazing. Otago University, New Zealand. ©Bruce Ford. Bruce explained that prior to revision of their lighting guidelines, the National Museum of Australia (NMA) typically displayed materials thought to be light sensitive for 2 years per decade. After a subsequent ‘resting’ period, objects would be returned to display, and the cycle repeated. Through his studies using micro-fading, Bruce was able to determine that numerous objects presumed to be light sensitive were in fact more stable than the 2 years exposed in 10 restriction implied (and could therefore be displayed for longer periods), while for a smaller number of items the same restriction was too generous. By measuring fading rates, very fugitive colorants were able to be identified and better protected without the need to restrict access across the board. By being more selective about restrictions using a combination of microfading and a structured significance assessment, the museum has been able to save thousands of dollars in the cost of exhibit changeovers. 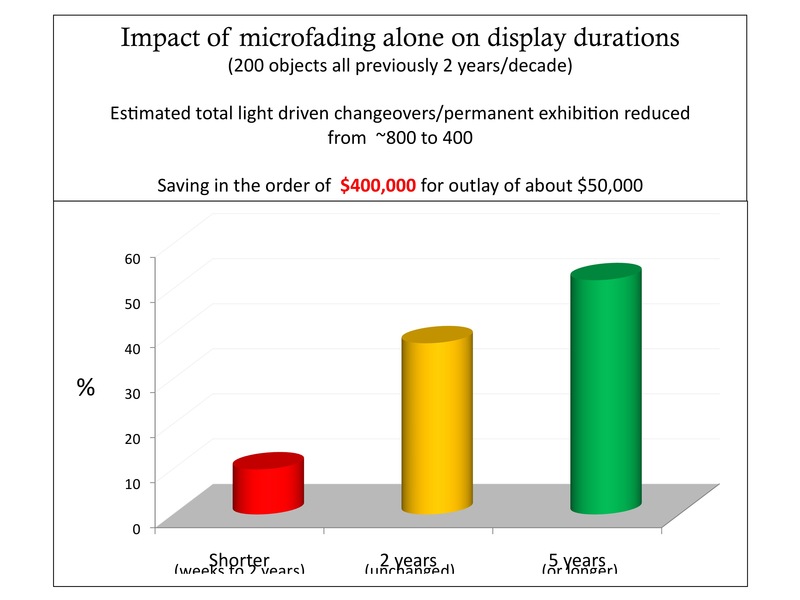 Illustration of potential cost savings using exhibit guidelines revised based on microfade testing. Green = extended display, yellow = unchanged display guidelines, red = displayed less than 2 years per decade. The MFT can also be used in an anoxic environment to determine whether display in such conditions will have any appreciable benefits for the object in terms of color preservation. Some colorants may fade more rapidly in the absence of oxygen, for example Prussian blue and iron gall inks. Interestingly both of these examples undergo a reaction with oxygen which opposes the light-driven color loss but which cannot be measured using microfading or any other accelerated light exposure method. Again, this demonstrates how under-informed assumptions about reducing light damage can be unjustifiable and costly. Data from microfading tests can supplement other information about the artifact to better inform decisions impacting an artifact’s display life. Using an evidence-based approach to manage display policies can prevent wasteful use of precious funds. Such resources can be redirected towards more needy causes. MFTs are available for purchase as kits at around $20K. Alternatively, one may contact a nearby colleague or institution that owns one to inquire about arranging for access. Currently, there are 24 MFTs in use worldwide. More information is available through Bruce Ford’s website, www.microfading.com.